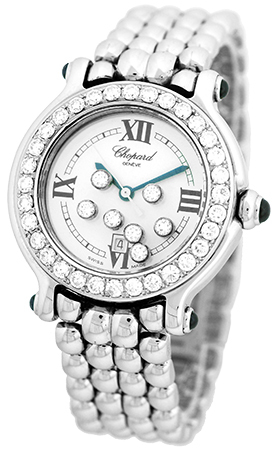 Lady's Medium Stainless Steel Chopard Diamond "Happy Sport". White Dial with Black Roman Numerals and Date Indicator. 7 Floating Bezel Set Diamonds under the Crystal, Blue Sapphire Cabochon on Winding Stem. 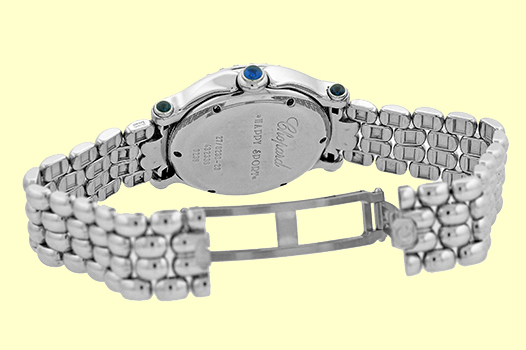 Matching Stainless Steel Chopard Happy Sport Bracelet. Custom Geneva Collection® 18K White Gold Diamond Bezel. 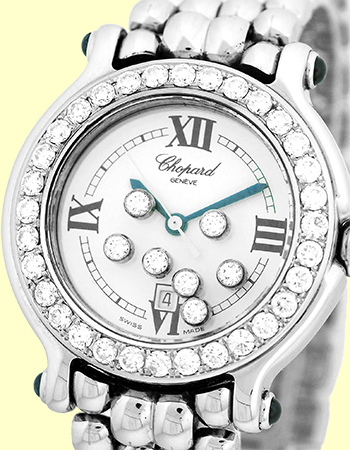 The "Happy Sport" by Chopard. A sleepy little company nestled in the Swiss Alps. One of their designers came upon this theme of the floating diamonds a few years back and it has become a worldwide marque by now. This beautiful watch is fashioned in virgin stainless steel with the typical Swiss high polish, which makes it appear as if it were platinum, or at the very least white gold. Yet, you have the durability of stainless steel, it can take hard usage well. It is elegant, sophisticated, dependable, and CHEAP! This is the ideal designer watch for the gal on the go. Chopard is an extremely hard company to ever get a discount on. They do not look favorably on discounters in their midst. Supply is limited! Don't Wait! 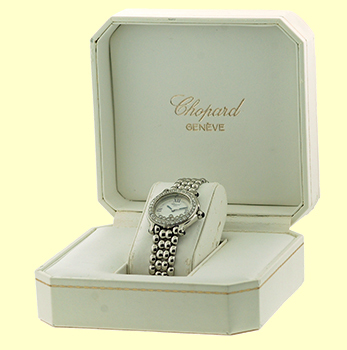 Like New Perfect Condition with Chopard Box and complete with Capetown's Lifetime Warranty! !